A single enzyme. That is all the researchers behind a new study need to manipulate to prevent the feared Ebola virus from spreading. Because with the enzyme they also take away the virus’ ability to copy itself and thus produce more virus particles and more infection. The study has been published in the scientific journal Molecular Cell and was conducted by researchers from the University of Copenhagen and Phillips Universität Marburg in Germany. ‘When the Ebola virus enters the human cell, its only purpose is to copy itself, fast. First it must copy all its proteins, then its genetic material. But by inhibiting a specific enzyme we rob the Ebola virus of its ability to copy itself. And that may potentially prevent an Ebola infection from spreading’, says Professor Jakob Nilsson from the Novo Nordisk Foundation Center for Protein Research. A few years ago the Ebola virus ravaged West Africa, where thousands of people died from the extremely infectious Ebola infection. Once you are infected, all you can do is hope that your own immune system is able to kill the infection. Because there is currently no available treatment. 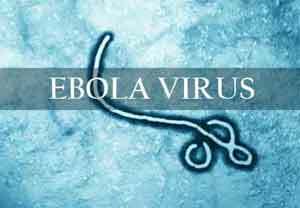 However, the researchers behind the new study have found what is called a new host factor for Ebola virus. It can be described as a small part of the host’s — for example the human body’s — own cells, which the Ebola virus uses to copy itself and produce more infection. The virus uses the host factor enzyme PP2A-B56 to start producing proteins. So if the researchers switch off PP2A-B56, the virus’ ability to copy itself and produce more infection is never ‘switched on’. ‘When we inhibit the PP2A-B56 enzyme, we remove the first link in a long process, which ends with Ebola spreading. And we can tell that it works. The Ebola infection in cell cultures where we have inhibited the PP2A-B56 enzyme is 10 times smaller after 24 hours compared to infections where we have not inhibited this enzyme’, says Jakob Nilsson. But because the researchers have so far focussed on cell cultures, there is still work to be done before their results can be used to treat people infected with Ebola. Initially the researchers hope to be able to test it on animals and, in the long term, develop a drug that inhibits the relevant enzyme. The potential of the new discovery may turn out to work on other viruses too, because the structure of Ebola virus is very similar to the other so-called filoviruses, Lloviu virus and Marburg virus. But whether the same mechanisms apply to them too still needs to be uncovered.